Two Calc functions for counting cells or cell content by cell style. Compatible with both Apache OpenOffice and LibreOffice. COUNTSTYLE is an extension dedicated to the Calc module. It is aimed to perform operations based on the cell formatting, such as typically (but not only) the background colour. Download the most recent countstyle-x.x.x.oxt file and install it from Tools->Extension Manager. Countstyle adds two new functions to Calc, accessible from the function wizard: COUNTSTYLE and CELLSTYLE. Formulas using these functions are automatically updated when a new style is applied. 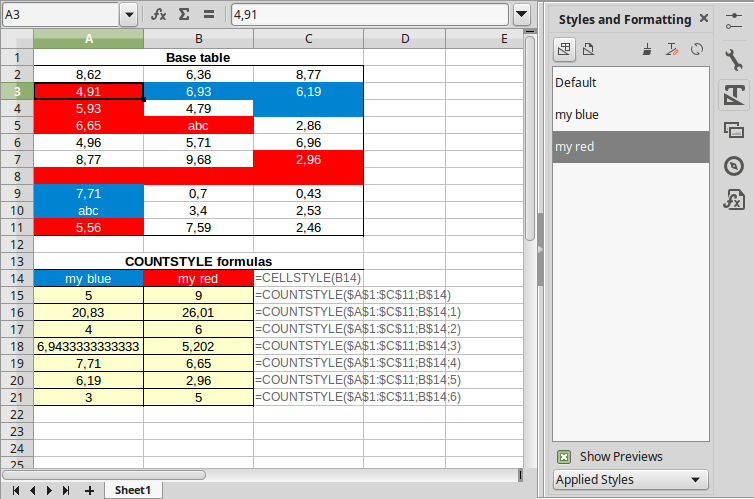 By design, COUNTSTYLE only counts cells formatted with the style given as argument. Direct formatting is ignored and colour names are not allowed. COUNTSTYLE doesn't work with style applied by mean of conditional formatting: not only would this be awkward and unwiedly (there is no easy API method to retrieve such colouring), but also useless, as you just need to count cells on the same condition used for formatting. Why counting styles rather than colours? It's far easier for the user to define a style rather that trying to retrieve a colour reference. And what should this reference be: the colour name?, the decimal value?, the rgb or the hexadecimal representation? Colour are not the same for everyone, and besides, colour names and values differ between OpenOffice and LibreOffice. For example, OpenOffice "red" is rgb 255,51,51, while one would expect 255,0,0!